guided improvisations - like guided meditations, but you play music with them. chords - the building blocks of songs and melodies. chord progressions - including backing tracks to help you improvise on your Sansula. 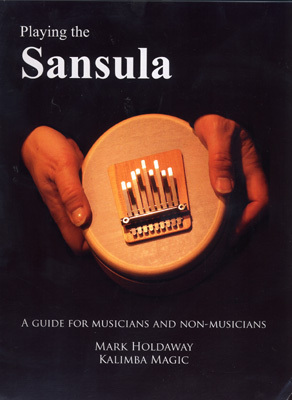 Sansula tablature - helps you learn precise phrases or songs, but this section also teaches you general methods to help you create your own music. other tunings - we provide some tablature and chord dictionaries for the standard tuning and three alternative tunings, including Beautiful A, Heavenly E, and Morocco E.
other resources - we provide links to more Sansula information. Size: 21 x 28 cm, Paperback 96 Pages. CD 72 mins.